a model that shows a progression that adopters of educational technology typically follow as they progress through the stages of teaching and learning with technology. In the substitution level, teachers or students are using new technology tools to replace old ones. For instance, using Google Docs to replace Microsoft Word. the task (writing) is the same but the tools are different. Though it is a different level, we are still in the substitution mentality but this time we add functionality(s). Again using the example of Google docs, instead of only writing a document and having to manually save it and share it with others, Google Docs provides extra services like auto saving, auto syncing, and auto sharing in the cloud. This is the level where technology is being used not only to do the same task but to redesign new parts of the task and transform students learning. An example of this is using the commenting service in Google Docs, for instance, to collaborate and share feedback on a given task task. 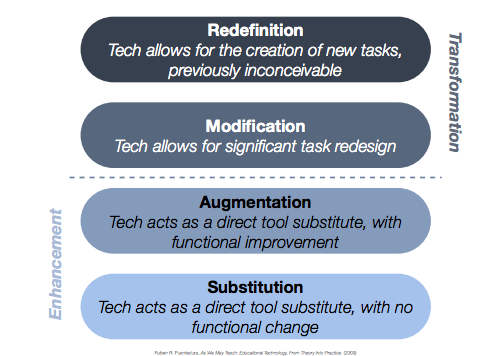 Redefinition means that students use technology to imperceptibly create new tasks. If we were to place the Redefinition level in Blooms Revised Taxonomy, it would correspond to synthesis and evaluation as being the highest order thinking skills. An example of redefinition in Google Docs is "when students connect to a classroom across the world where they would each write a narrative of the same historical event using the chat and comment section to discuss the differences, and they use the voice comments to discuss the differences they noticed and then embed this in the class website".